The NFL has announced its selections for the 2018 All-Pro Team, so we’ve taken a closer look at this year’s picks to delve into the biggest snubs. To see who we selected to make the team, check out PFF Senior Analyst Mike Renner’s selections here. Touchdowns aren’t always the best way to look at individual’s production, and that’s the case for Barkley’s oversight. 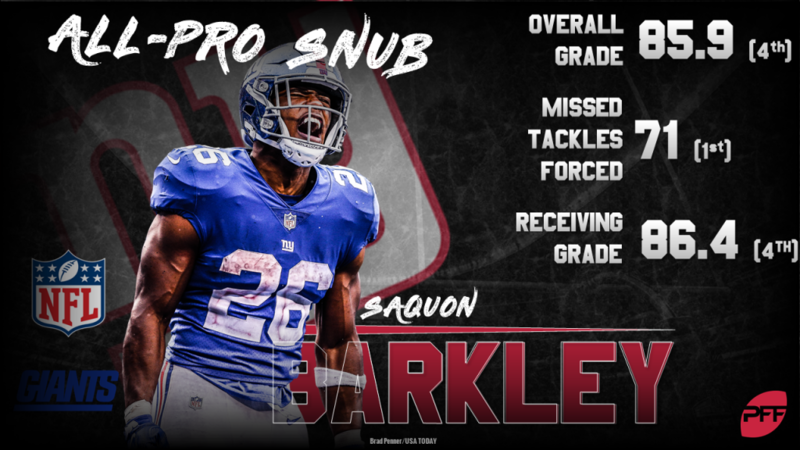 The rookie second overall pick led the league with 71 missed tackles forced, forcing 31 missed tackles after the catch, a number alone that would rank him 20th among all running backs in terms of total missed tackles forced. 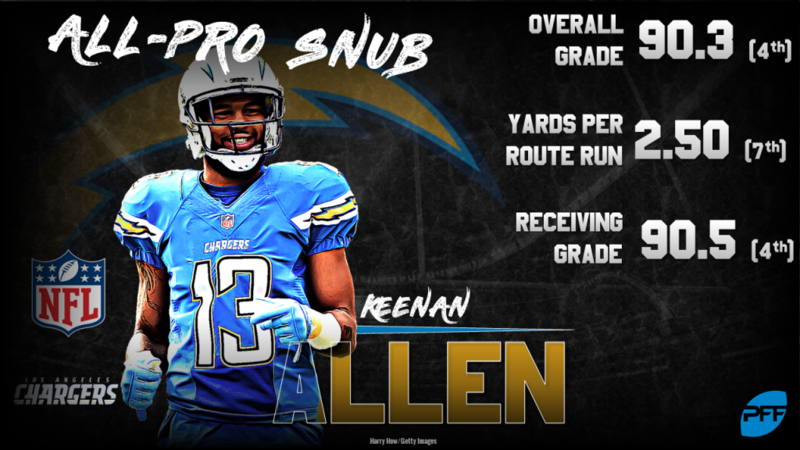 Allen finished fourth among the league’s wide receivers who saw at least 60 targeted passes this season, hauling in a ridiculous 77.0% of his 126 targets. In fact, of the group of 23 receivers who had at least 100 passes thrown in their direction, only First-Team All-Pro Michael Thomas hauled in a higher catch rate. Another swing and miss, Mason was the league’s highest-graded guard, impressing equally in pass protection (16 pressures surrendered on 526 snaps) and as a run-blocker. 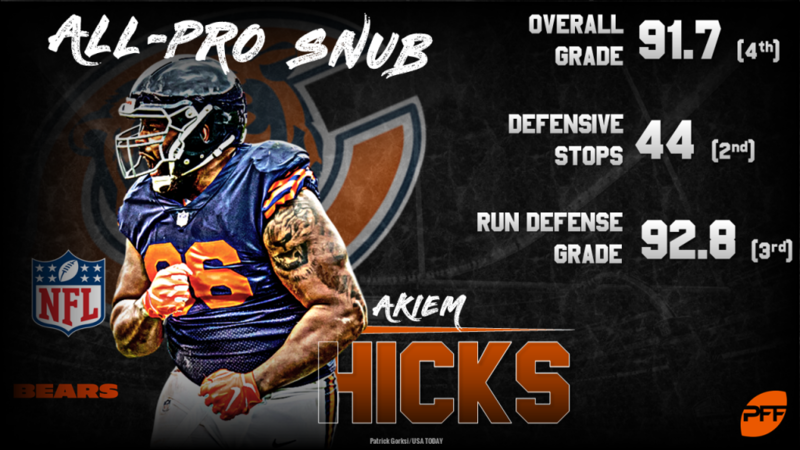 His ability to move defenders off the line at the first step was second to none at the guard position, finishing with a 77.8 run-blocking grade that was No. 1 at the position. Long since the best pass protector at the center position, Hudson’s pass-blocking dominance was once again on display for Oakland. He was by far the highest-graded pass-protecting center as he finished the year without allowing a sack for the second time in his career. He has now allowed just three combined sacks and QB hits over the past three seasons. Flowers may not have apparently had the ‘splash plays’ necessary for his name to be listed but he disrupted the opposing offense about as well as any other edge defender in the league this season. His 65 total QB pressures and 37 defensive stops are top 10 marks and he did so while only missing two tackles on the season. If the aforementioned Flowers couldn’t make it, it’s no surprise to see Hicks left off as well. All he did in 2018 was finish as the third-highest graded interior defensive linemen and hold top 10 marks himself in both pressures and stops. His effect on the game didn’t stop there, however, as he also batted five passes and chipped in by forcing three fumbles, all from the interior of the defensive line. Lost in the shuffle that was the middle-of-the-pack Redskins defense this year, Brown was a sure tackler and was rarely beaten in any regard whether it was coverage, run defense or the rare occasion he blitzed the passer. If sacks are to defensive linemen as interceptions are to defensive backs, it also makes sense to see Peterson left off the list. Regularly following the opposing team’s No.1 receiving threat is no easy task but one Peterson handles more than admirably to the tune of a top 10 overall and coverage grade. 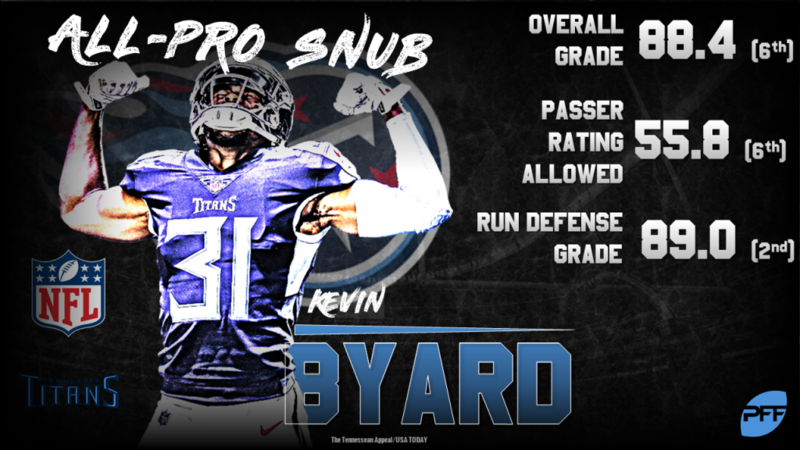 The new breed of safety is upon us as Byard was disruptive both as a pass-rusher (seven pressures on 23 blitzes) and in coverage, despite the latter forming a less than ideal indicator of safety play. Despite that, Byard recorded four interceptions and three more pass breakups and didn’t allow a single reception over 17 yards. Simply put, Jackson was nothing short of stingy in coverage when it came to limiting points. He finished the season as one of just two cornerbacks to see at least 80 targeted passes and not allow a touchdown.